I am not without hope of delighting to find the essential Coast Road novel. Expectations defined in a previous post on two Coast Road-titled books ended with a request that, at the very least, when a book is titled, “The Coast Road,” then the reader better find plenty of setting along the Coast Road. Elizabeth C. Ward’s 1983, Coast Highway 1, has it all: A pissy, Stanford alum, University of Irvine comparative literature professor who translates nineteenth-century Spanish novelists, and intentionally grades his best student’s extraordinary paper a B+. Jake Martin finds the extraordinary student lying dead one foggy morning, under the bougainvillea of his Spanish stucco courtyard. “It was too late to go home, even for a change of clothes. I bought a map of the coast highway and headed south.” Jake Martin exits his next locations (Balboa Bay Club, San Juan Capistrano, Encinitas, even Ensenada), always in the nick-of-time. Bullets prod his every departure. The reader finds plenty of setting along the Coast Road. In Pismo Beach, Jake races through Oceano Dunes to evade a dune-buggying pursuer. To reach some inland locales, such as Jake’s side-trip to Stanford campus, Elizabeth Ward writes, “I left the sea at Pescadero and turned inland through the artichokes and up into the redwood canyons that wind up to Skyline Drive.” At Fort Point, Jake exchanges words under the shadow of the Golden Gate Bridge with the sergeant assigned to the case. 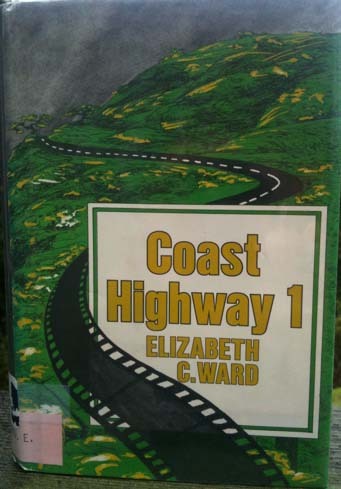 Elizabeth C. Ward’s Coast Highway 1, is fairly essential as a Coast Road Read. It is certainly a bunch of fun to vicariously romp along its settings up and down the California coast. Elizabeth wrote two other books, both published in the 1980s, A Nice Little Beach Town and The Lost Day. Ms. Ward has lived in Newport Beach for most of her life. A little article on Ms. Ward. If you are interested, I just finished Ward’s “Nice Little Beach Town,” and that was a fun read too! It is about political corruption in the development of Newport Peninsula. Can’t wait to read it! I actually liked Barbara Delinsky(? )’s Coast Road, even though the descriptions were not completely accurate. Also, you might want to take a look at Palisades, which takes a lot of license with the road and what is on it, but the novel is really about relationships – familial, love, etc. not about The Road, of course, but I like Lillian Bos Ross’ books about the hills and coast of Big Sur, even if the plot can be a bit melodramatic at times–solid prose, though. “Spring comes to the high hills in the Sur country at the turn of the year, when the new green blades start pushing away the folded-down gold of last year’s grass, and even the sorriest man feels hopeful.” It just sort of swings easliy along, and you get caught in the current. guess I’ve got some re-reading in store. I haven’t seen that book in my research of books about our coast. I think I’ll have to look again.